I absolutely love Whole Foods Market! And that stupid joke about “whole paycheck” is total BS - they’ve got really competitive sales and amazing coupons all month long. Just visit their website, enter your location, and you too can rack up crazy discounts on a huge variety of items. Read on to learn about great events taking place at the Carrollwood Store, South Tampa and Clearwater locations in March! Our Tampa Bay area stores also have some cool events coming up. If you’re looking to meet new people, Whole Foods Market events are a great place to find folks who enjoy healthy food, craft beer, and fair trade coffee as much as you do. On Tuesday, March 28th at 7 pm, check out the Grilled Cheese & Beer Benefit at the Whole Foods Market | South Tampa location. Grilled cheese is the most perfect food in the world; when paired with the right beer, there is nothing finer! This event features creative collaboration between their Certified Cheese Professional and their Certified Cicerone, giving you an extensive knowledge of beer and cheese in one night. 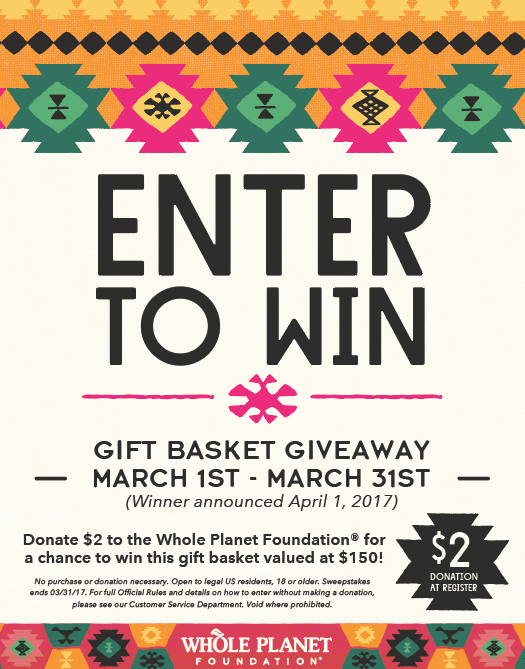 All month long in Tampa, Gift baskets will be available for a raffle, with proceeds benefitting the Whole Planet Foundation. Baskets are valued at $150 and can be won with a $2 raffle ticket available at Customer Service or Check-out. Whole Foods Market | Carrollwood will host Cupcakes for A Cause on Friday, March 17th at 6 pm. Cupcakes are already the best thing ever but taste even better when you know you’re contributing to poverty alleviation in the developing world through microcredit loans that build better lives. They'll provide the giant cupcake, frosting and candy, you bring the creativity. All ages are welcome! Tickets are $8, and you can RSVP at the customer service desk or by calling (813) 264-3600. 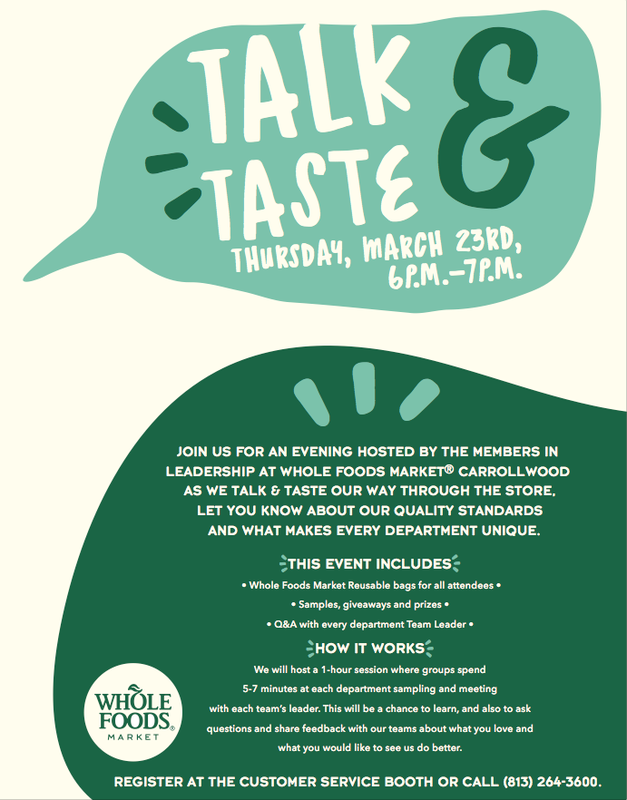 If you really want to get to know Whole Foods Market, join the team leaders at the Carrollwood store for Talk and Taste on Thursday, March 23rd at 6 pm. It’s a guided tour through each department of the store, enjoying samples, learning about quality assurance, and speaking with experts. Each guest will receive a reusable shopping bag, and there’s a bunch of other giveaways and prizes! It’s free, and you can register here. The Clearwater location is having a Same Bar, New Menu Tasting on Thursday, March 30th at 7 pm. 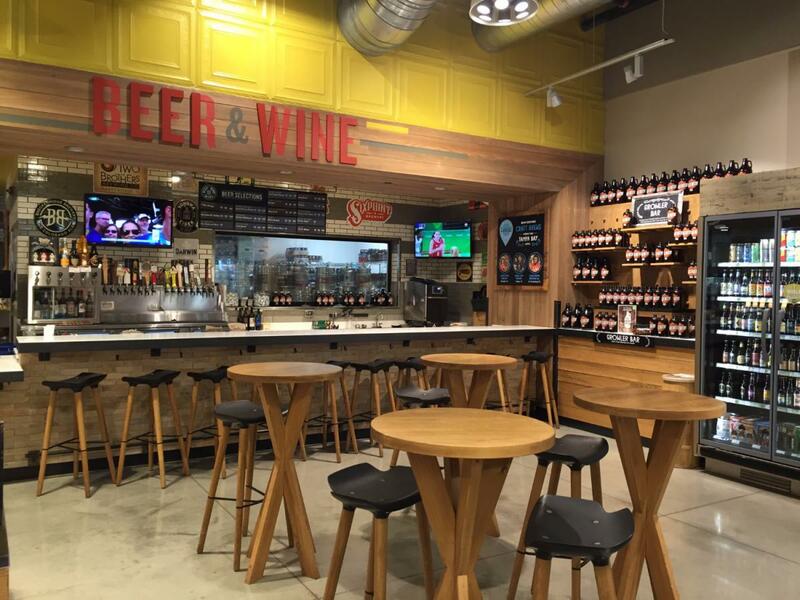 Whole Foods Market has rolled out a brand new menu at their in-store bar, Bar 19. Get ready to taste a perfectly paired fresh lineup of light bites, wine, and craft beer. This is a great way to sample several items on the new menu, ask questions and enjoy good company. Featured snacks include boom boom shrimp and something wonderful called Midnight in Miami. Tickets are $10 and it’s first come, first serve basis, so get ‘em now! If you love coffee, have a cup at Whole Foods Market on Pi Day (3.14.2017) at any of the local Whole Foods locations, and help to alleviate poverty. On March 14th Allegro Coffee Company will be celebrating by giving back to the countries and communities that farm their amazing coffee. For every freshly brewed coffee purchased at Whole Foods Market, Allegro will donate $1 to Whole Planet Foundation. Also happening this month at all three locations are BIG SAVINGS on Beauty items. March 22nd - 28th is Beauty Week at Whole Foods Market. A week dedicated to helping you become familiar with their vast selection of clean beauty products, high-quality standards and the exceptional service a Whole Body department provides. Facial Care & Cosmetics will be available at 25% off, and on March 24 you can score a Limited Edition Beauty Bag valued at $90. Priced at only $18, Beauty Bags will be sold while supplies last. Each store will receive 50 bags so be quick! Mark your calendars now!